This double pom beanie hat pattern is an excellent project for anyone who is learning how to knit. 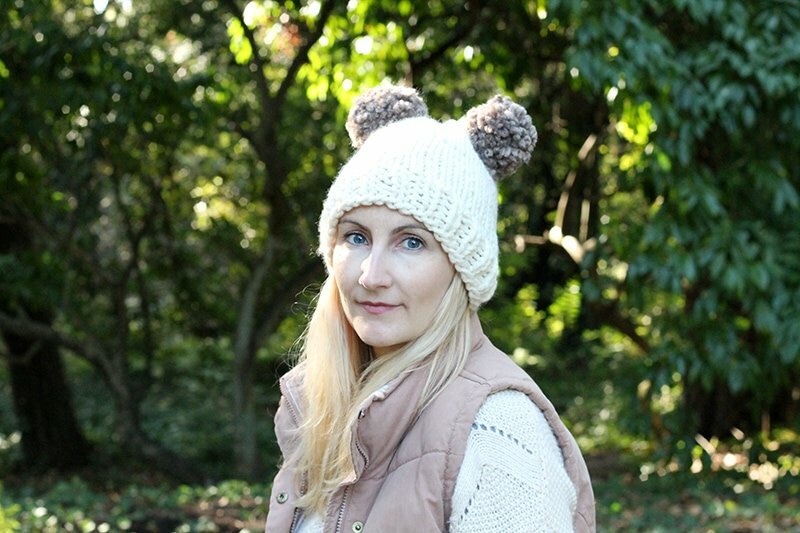 I wanted to share with you an easy hat to knit, that has not one but two pom poms! 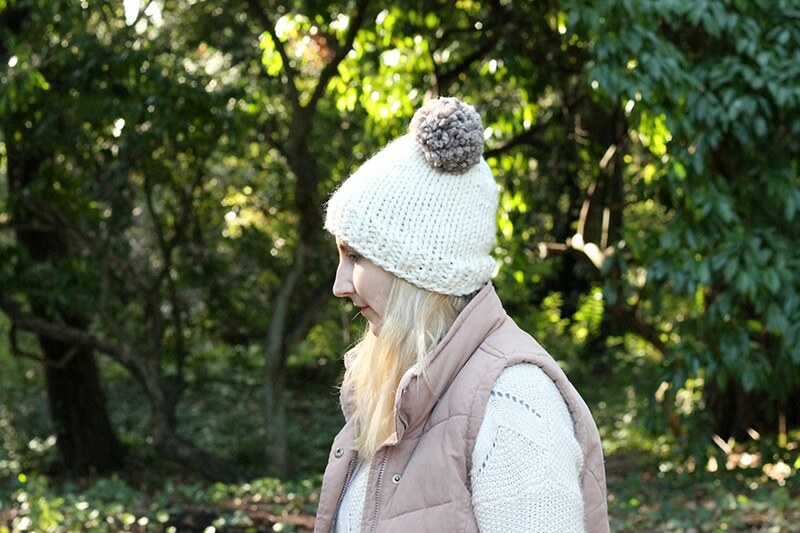 This hat is perfect for the colder weather, as it has been knit with super bulky yarn, in one of my favourite colours – fisherman (Lion Brand Wool-Ease Thick and Quick). This knitted hat has two large poms added and will be super cozy to wear in the cold weather. I made the hat using Lion Brand Wool-Ease Thick and Quick yarn in fisherman and for the poms, I used the same yarn in the colour barley. I knit this hat on size 10 mm (US 15) 16″ circular needles, so there was no seaming involved, just a few loose ends to sew in at the end. 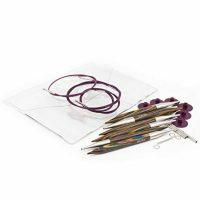 If you are new to using circulars, once you get used to them, they soon become your favourites to work on. 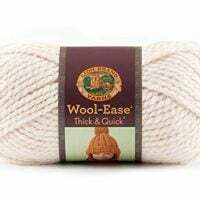 The hat uses basic knitting stitches – knit and purl, to create 2×2 ribbing for the brim of the hat. 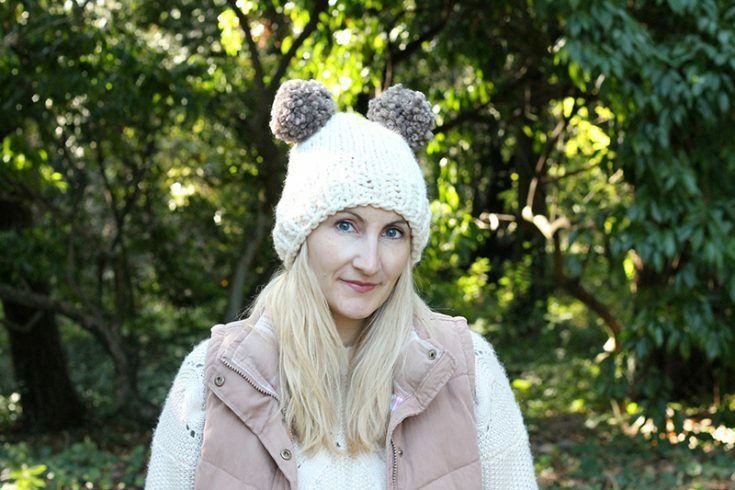 The hat can be worn as a slouchy beanie or more fitted. 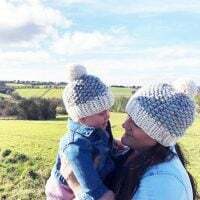 This double pom pom hat pattern is great for any beginners who are looking for an easy project, as it is perfect for practising the basic knitting stitches. The hat size is for adults and can also be adapted if you want to make it smaller or larger, just measure the circumference of the recipients head and adjust the number of stitches you cast on. 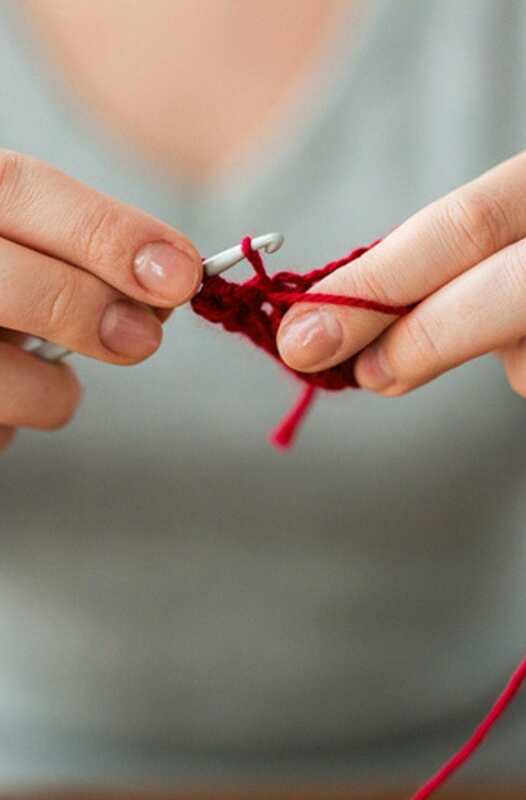 For example, I cast on 38 stitches for an adult, but for some people, you may need to cast on 40 stitches or more (or less, for example, 36 sts if they have a small head). 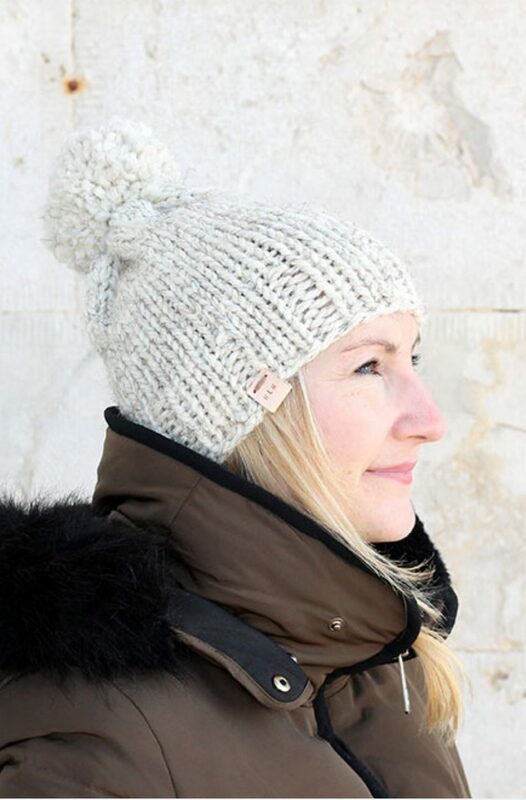 This hat is perfect for fall or winter days walking through the snow, wearing on the way to work or even for a day building snow people! Wherever you want to wear this hat, it will be sure to keep you warm and toasty, protecting you from the cold winds and snow showers. We don’t have bitterly cold temperatures here in Corfu, Greece, our winter weather is like other countries fall weather, quite mild and rainy. I was a bit hot when posing for these photographs! 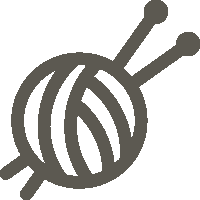 If you would like to make more knitted items/hats for women, please take a look at the other patterns in the women’s knitting pattern library. Make this easy hat with an easy to print out pattern below, then come back and let me know what you think in the comments or leave a review! Super bulky weight (06)– 106 yards. 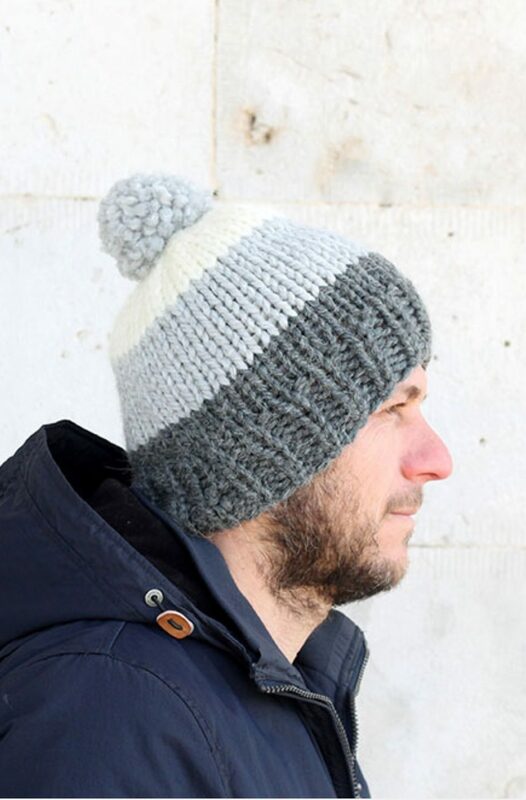 Make two pom pom's and stitch securely either side of the 'hole' that you can see in the middle of the top of the hat in a coordinating colour. 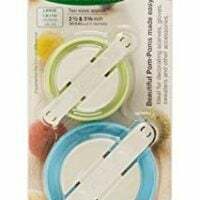 I used a clover pom pom maker for the poms but there are many tutorials out there on other methods. Size - Adult / Height w/o pom = 9 inches / Width = 8.5 inches flat and unstretched. Love your patterns, thank you so much for sharing them.